Undefeated junior middleweight champion Saul “Canelo” Alvarez (41-0-1, 30 KO’s) and undefeated Austin “No Doubt” Trout (26-0, 14 KO’s) is scheduled to meet to unify their 154-pound belts on April 20, 2013 at the Alamodome in San Antonio Texas in the main event of a Showtime card. Well do you have Alvarez vs Trout predictions? For me the chances of Canelo defeating Trout next month aren’t very good. Canelo is more of a bigger version of Cotto, and with the same flaws and limitations. Trout does well against those types of fighters. I can’t see Canelo winning that fight, and the more than likely he’ll suffer his first loss of his career. Already 12 thousand tickets have been sold for the fight that will take place for the 72,000 seat stadium at the Alamodome. 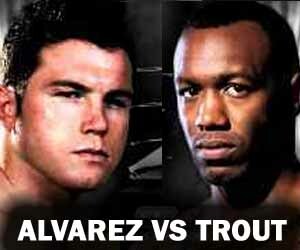 But the Alvarez vs Trout highly anticipated match want more fans to watch the fight live. So Tickets for Alvarez vs Trout are still in extremely high demand. As a result, two bleacher packages will be added to the existing set-up allowing for additional seating for over 3,000 people. Buy Alvarez vs Trout Tickets now before all tix will be sold out. The bookmakers odds favour Alvarez considerably but based on these details it should be 50/50 or Trout the slight Favorited. His win over Cotto is more impressive than his counterparts accomplishments. Until now Trout has not had the publicity or recognition he deserves. If he wins against the glorified golden boy, the future will look very bright for “no doubt” Trout.